This Direwild review was made after playing the game four times. We were provided a copy of this game by the publisher in exchange for an honest review. 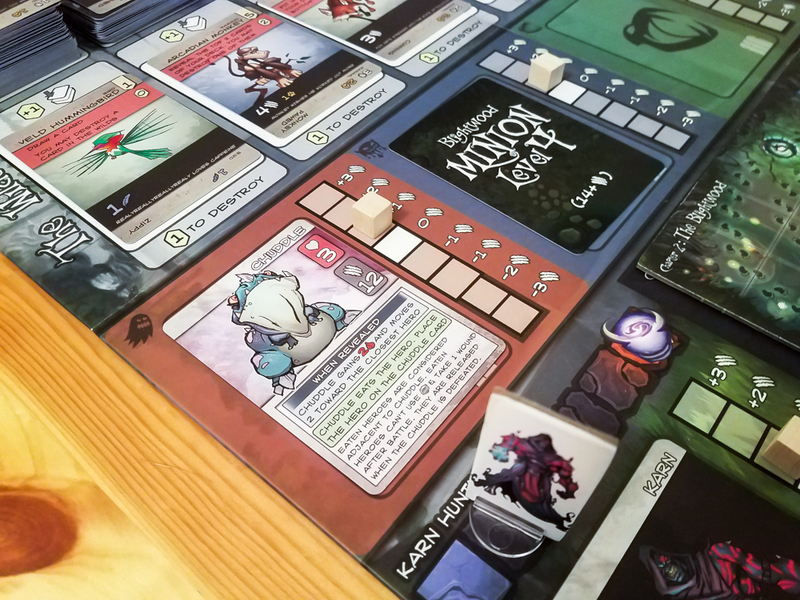 Direwild is a cooperative deck building dungeon crawl from Vas Obeyesekere and Iron Horde Games. You are animists attempting to build up your collection of creatures so you can stop the evil Karn. Most games of Direwild are played over three chapters, with the final chapter taking place in Karn’s dungeon. It’s possible to defeat Karn before you reach his dungeon, but don’t expect that to ever happen. Your goal in the first two chapters is to clear out all of Karn’s minions with your characters and your creatures, and then you’ll face Karn in the final showdown. Each of the 10 characters in the game has a passive ability and two magic abilities. The passive abilities can be used anytime, while the magic abilities need to be paid for with active gems. 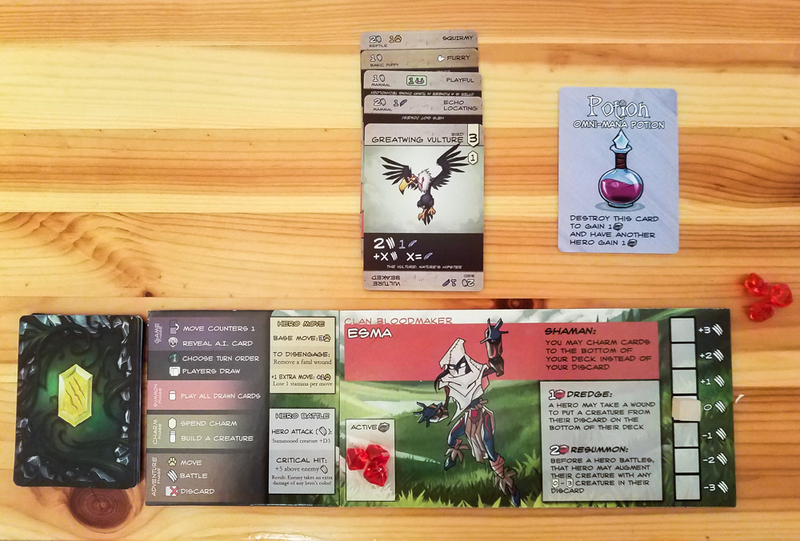 Characters start the game with two active gems apiece and can gain new ones by defeating enemies and with certain card effects and character abilities. Characters also begin the game with eight basic creature cards (puppies and kittens) and two basic special creatures. This is a deck building game so you’ll be buying new cards every round, giving yourself better creatures that you’ll be able to draw during future turns. Sometimes you’ll buy cards based on their stat lines or their abilities, while in other cases you’ll buy them because they have synergies with the other cards you’ve bought. There are six Fatal Wound cards placed on the board at the start of each chapter. These represent the characters’ resilience against Karn’s influence. Those cards are removed when you lose battles, when you disengage from enemies, and when Karn shows up on the board. Game Phase – All characters’ stamina tracks adjust either up or down towards zero. This is also when you draw an Enemy AI card, which will tell you how the enemies move, if idle enemies activate, and if they all get stronger. Karn moves closer to his alter on the current board every time an Enemy AI card is drawn, or he deals a Fatal Wound if he’s already on the board when the card is drawn. After the Enemy AI card is resolved, players get to choose their turn order and draw five cards from their decks. Summon Phase – This is when, in turn order, players play all of the cards in their hands. It’s important to pay attention to the order in which you play your cards since many of them will have abilities that combo with previously played cards. Charm Phase – Most of the characters you summoned in the previous phase generate charm, and this is when you combine it all together to get more creatures from The Wilds. You can also use charm to discard a card from The Wilds, to place a creature you just bought on top of your deck, or to destroy lock cards. The first set of lock cards block you from buying advanced creatures and the final three sets unlock new abilities that everyone can use once you’ve removed them. At the end of the Charm phase, everyone will build a creature from the cards they played during round. To do that, you choose one core creature and then flip all of the other creatures upside down to give the core creature augmented powers. Adventure Phase – This is when you move around, collect treasure, and fight the enemies. When battling, you’ll roll a die and combine that number with the current attack of your character (the number on the stamina track) and the attack of the creature you created and compare that number to the attack and stamina level of the enemy. If you win, you’ll place one of your gems on the enemy’s card to represent damage. If you lose (or tie), you’ll take a Fatal Wound and see if the enemy has any Hit Effects. When you defeat an enemy, all of the gems on that enemy’s card are returned as active gems. At the end of each round, you’ll check to see if any Fatal Wounds are left in the pile. If there are any remaining, you’ll move on to the next round. If they’re all gone, you lose. If you’re playing the first or second chapter and you’ve cleared out all of the minions, you’ll move on to the next chapter/board. All you have to do to start the next chapter is place the new enemy minions on the board and possibly place new treasure tokens. There is a save system in the rulebook that allows you to save the game state after finishing a chapter. There are also instructions for starting a game at later chapters. You’ll mostly be focusing on fighting Karn once you reach the Final Dungeon. This is very similar to fighting the other enemies. You’ll compare your attack to Karn’s and, instead of placing gems on his card, you’ll discard cards from his deck. After the battle, you’ll flip the last discarded card to see his counterattack. He has Regenerate cards at the bottom of his deck that make you put all of the previously discarded cards back on top of the deck. If you get through his deck enough times to remove all of the Regenerate cards, you win! That’s a basic overview of how Direwild plays. If you want to see all of the rules, check out the official Setup and Gameplay rulebooks. Check out our Top 5 Cooperative Deck Building Games! Easily the coolest thing about Direwild is creating the unique creatures. You really can’t predict the types of creatures you’ll end up creating, but you’ll definitely remember the ones that got you out of sticky situations. The deck building feels fresh and new thanks to the large, randomized decks of creatures. You never know what’s going to show up in The Wilds, making all of your deck building choices interesting. There’s a ton of strategy in this game. You have to think long-term about creature synergies and you need to work with your teammates to figure out how to attack all of the enemies. The challenge the game presents seems just about perfect at each player count. Avoiding those Fatal Wounds is tough even early on because you might have to run away from tough enemies or you might just get unlucky in battles. I’ve won just one of the four games I’ve played so far, but each one did feel winnable. I like that you can use your charm in multiple ways, not just to buy cards. It never feels good to have leftover money in other deck builders, and they fixed that in this one by giving you more options. I especially like that you can spend one charm to put a new creature on top of your deck. The rulebooks are excellent. The main rulebook has full descriptions of each phase of the game (including pictures), but what I really like is that there are summaries of all of the rules in the margins for quick skimming. There are also card clarifications in the rulebook for just about every card in the game. Direwild has very high replay value. Not only will The Wilds have different creatures showing up, you also don’t know which enemies you’re going to be facing and Karn himself always acts differently. I’m not a fan of this game’s long, vertically-designed board since no one is in a good position to read the cards. This isn’t as much of a problem once you get to know all of the cards, but that won’t happen until you’ve played the game a bunch of times. I’ve played Direwild with seven people so far and the main complaint has been that it is too long. There is a save system and a way to start the game at different chapters, but I think most people will want to play the full three-chapter game in one sitting. A lot of the fight outcomes come down to the roll of a die. Some people will find that exciting, but I know quite a few people who don’t like that type of randomness in their games. I don’t mind it too much, but it’s definitely frustrating when you have a bunch of bad rolls in a row. It’s very clear to me that a lot of work went into making Direwild. The characters all feel different, it’s fun creating the creatures, and it’s a solid challenge at all player counts. I think it’d be even better with a classic, horizontal board and a shorter playing time, but overall this is a very solid deck builder that most people should enjoy. 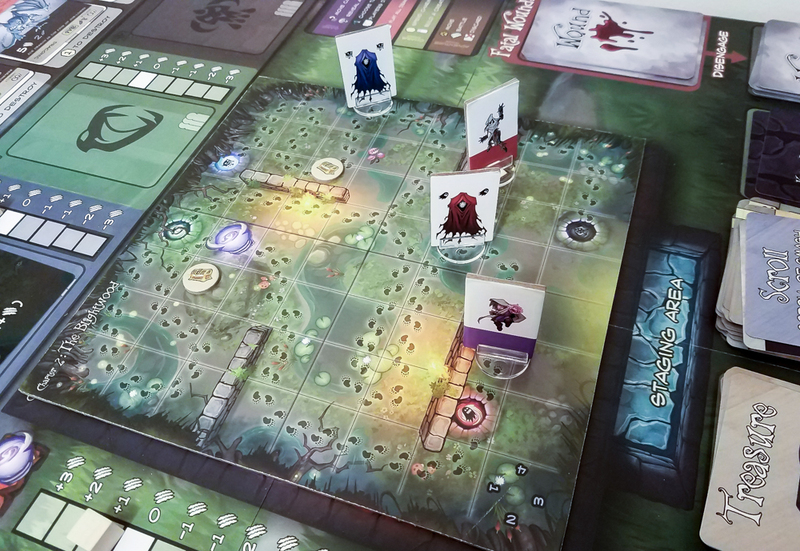 If you like dungeon crawls and deck building games, you definitely have to check out Direwild. 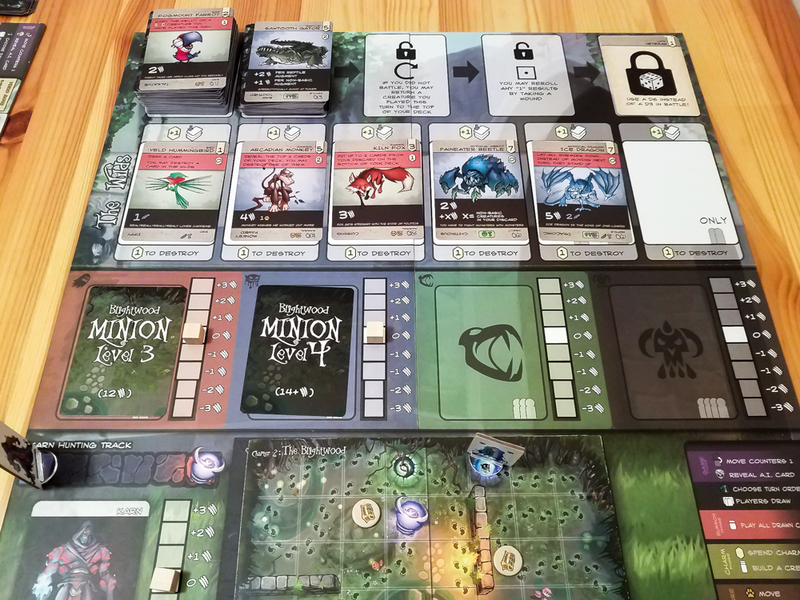 If you aren’t a big fan of deck builders but do like dungeon crawls, I’d still say give this one a try because of the huge selection of cards you can buy and the cool creature creation and battle systems. 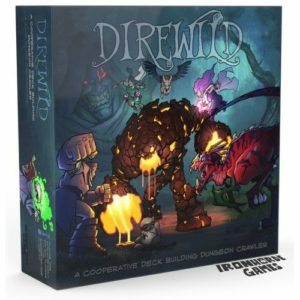 UPDATE #1: Direwild made it onto our Best Cooperative Board Games of 2018 list! UPDATE #2: Direwild also made it onto our Best Deck Building Games list! Thanks for taking the time to read our Direwild review! To stay updated on all things cooperative board games, follow us on Twitter, Facebook, or via RSS. How long does the game take to play 3 chapters? Top of the page it says 30+min, is that just for one chapter. The gameplay sounds pretty fun, I quite like the idea of some dice rolling in a deck builder, especially since it’s creatures doing the attacking, can’t can’t expect that squirmy furry playful echo locating greatwing vulture to be a killing machine 100% of the time. I’d say it’s 30 minutes per chapter at a minimum. None of our games have taken less than 2 hours, with the longest taking about 3. You can get through the game quicker by minimizing discussion time, but we never play that way. The dice rolling is only a potential issue early on when you have weak creatures and during some of the late fights with Karn. That Greatwing Vulture is one of my favorite early-game creatures. It’s awesome!